FileApp is quite simply one of the best iOS file managers and viewers around. Developed by DigiDNA SARL, you can use it to view and open PDF, HTML, MS Office and Open Office documents. It can also view jpg, tiff and gif image files, web archives, mp3, wav and other audio files. It can also view zip files. This really is more than just a file viewer because as noted above, it can play audio and video files. In addition to this you can transfer files to your iPhone using USB or iTunes file sharing. FileApp also lets you move documents using ftp or Wi-Fi. If you are going to use it to browse files, you can sort them by type, name, date or folder. There are a lot of other things that FileApp can do, such as delete folders or files, send email attachments, and you can use it for storing files sent from any other app. 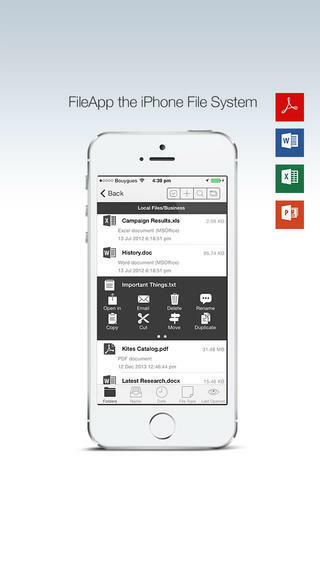 Using the app is very easy since FileApp uses the ‘open with’ option and shows the apps that you can use. Apart from the documents mentioned above, FileApp can also read plain text and RTF, iWork documents as well as iWork files. If you love to read comic books online you can use FileApp to read cbz files as well. If that is not enough it also has a slideshow for displaying images. The back and forward buttons make it easy to go through images. FileApp is in short, a very useful app. It can view all the popular formats and do a whole lot more. If you keep a lot of different files on your iOS, this is something you will want to keep close at hand.